A Kenya balloon safari offers an excellent opportunity to enjoy the country’s rich wildlife and breathtaking landscapes. Flights usually takeoff at dawn and last for about an hour. If there is one thing you have to do during your holiday in Kenya. Let it be taking a hot-air balloon safari. The experience in unforgettable. 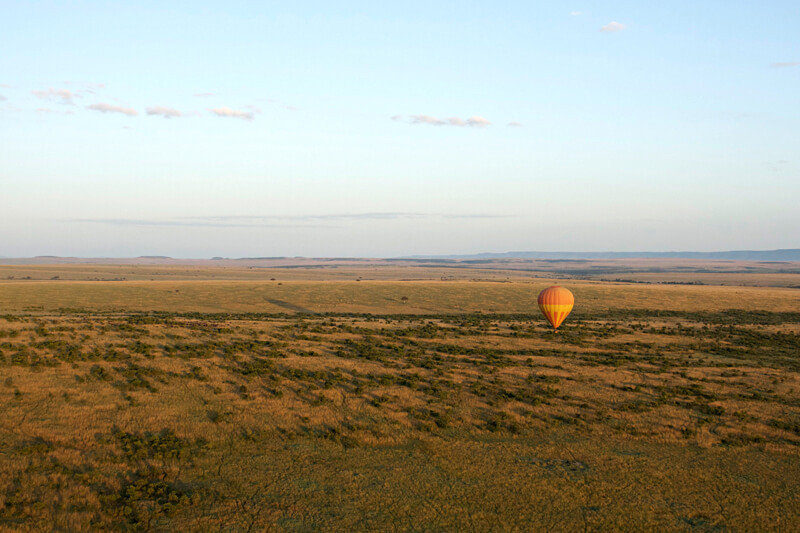 A Kenya ballon safari costs about KShs 45,000 ($450 USD). The Mara, as Masai Mara National Reserve is popularly known is Africa’s greatest wildlife sanctuary and the world’s most famous safari destination. Hot-air balloons liftoff at 6:30 a.m. when the air is still cool. The first hour after sunrise is the best for viewing the wild animals. In the Masai Mara National Reserve you will see the Big Five (lion, leopard, elephant, rhino and buffalo), numerous other plain animals ex., giraffes, zebras, wildebeests, elands, topi, kongoni, impala and gazelle, and over 500 species of birds including the secretary bird, ostrich, vultures and black eagles. Apart from the hiss of the banners the balloon flight is absolutely still and silent. You glide over the magnificent savanna plains, forests and rivers of the Masai Mara and have a great opportunity to take photographs. After the flight champagne breakfast, complete with flowers is served under an acacia tree. This is then followed by a leisurely game drive en route to your camp. Ballooning is the best way to appreciate the scale and sheer size of the Great Rift Valley. It stretches 4,285 kilometers from Jordan to Mozambique, with its width varying from between 30 kilometers to 100 kilometers. The Great Rift Valley is home to numerous species of wild animals and birds. Balloon safaris can be taken in Lake Nakuru National Park, which is world-famous because of the millions of flamingos that can be seen here and also several endangered species such as the black rhino. Although Serengeti National Park is not in Kenya, it can be visited as part of a Kenya Tanzania combined safari. The park is one of the most popular in Africa and has huge numbers of wildebeests and zebras. The hot-air balloon lift comes from the hot air in the envelope, which is slightly lighter than the surrounding cold atmosphere. When airborne a balloon goes where the wind takes it. However, because winds at varying heights have varying directions, the pilot can choose his height and hence his direction. The balloon can go as high as 15,000 feet, but it is kept at relatively low altitudes when viewing wildlife. The balloon measures 30 meters across the circumference and stands at 30 meters high. It can carry more than 2,000 kilograms, but generally carries 12 passengers. Children below the age of 7 years can’t participate in hot-air balloon safaris. The balloon is “powered” by ordinary cooking gas to heat the air in the envelope. If all power should be lost (something which has never happened) the balloon would enter a stable cold descent with the envelope acting as a parachute. This feature makes hot-air balloon one of the safest forms of flight. A Kenya balloon safari can be booked at the various camps and lodges. However, the flights get booked up very fast because they take place only in the morning. The best way to ensure you don’t miss your hot-air balloon safari is to book it in advance together with your tour. There are tailor-made tour packages that take you to safari destinations in Kenya and Tanzania, where you can take a hot-air balloon safari. Tours can be customized to meet individual requirements.